MUKONO – The Uganda Muslim Education Association (UMEA) Solidarity Games organizing committee led by Chairman Hajji Twahil Kiteezaala paid a visit to Kasawo Islamic SS, Mukono on Sunday 29th November 2018 to check on the school’s readiness to host the 2019 Games. The guided tour was conducted by Kasawo SS Director Hajji Kajaya Qasim as they inspected playgrounds, accommodation and secretariat among other key areas to be used during the Games slated for Easter period. The visit on Sunday was a continuation of the initial journey last year that saw the UMEA Sports Committee also pay a visit of the school with emphasis on play grounds, involvement of the community and security. 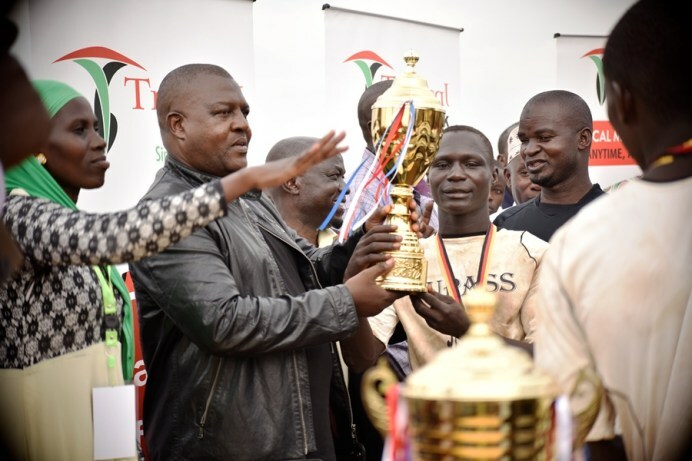 According to Hajji Kiteezaala, this year’s edition is expected to attract more than fifty schools with One thousand five hundred participating students anticipated to take part competing in disciplines like football, volleyball, netball, badminton, table tennis and handball. ‘We have visited Kasawo Islamic SS to check on their readiness for hosting the 2019 edition of the UMEA Solidarity games. We expect fifty or more schools to register for this year’s edition with seven hundred boys and eight hundred girls competing in a variety of disciplines including football, volleyball, netball, badminton, tennis just to mention’ said Hajji Kiteezaala. While the Director of the host school Hajji Kajaya couldn’t hide his excitement for the opportunity to host such prestigious competitions. ‘We are glad that we were granted the opportunity to host the 2019 edition of the UMEA Solidarity Games. We are set to receive any number of schools and participants because we have all what it takes to host the Games said Hajji Kajaya. ‘It is our dream to see the Games played under good conditions. The Games will attract many participants. We are happy with the progress in terms of preparations’ said Hajji Ntege Sabwe Abdallah (Committee Member UMEA / Executive Secretary UMTA). The delegation that travelled to Kawaso for inspection had; Hajji Twahil Kiteezaala (Chairman-UMEA Sports Committee), Hajji Hussein Lwembawo Kyagulanyi (General Secretary UMEA Sports Committee), Hajji Ndugwa Badru (Member UMEA Sports Committee and Executive Secretary of the Wakiso Secondary Schools Head Teachers’ Association-WAKISSHA), Hajji Ntege Sabwe Abdallah (Committee Member UMEA / Executive Secretary UMTA). The Committee will continue with further inspections to be updated on the progress of preparations. Tropical Bank, FUFA, Pepsi, City Tyres, NIC Holdings and Rwenzori Water have sponsored the Games in the past. Here are Defending Champions for the previous edition 2018 Hosted by Nkoma SS, Mbale).